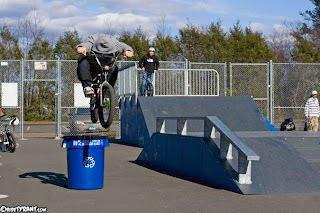 Bry and I rode the Cromwell park for an hour or so with Ryan Staron before Evan showed up and persuaded us to head over to Wethersfield. It was the first time we've been to the Wethersfield Skatepark this year and the Winter was not nice to the park. The majority of the flat bottom is cracked and chipped away making the place nearly un-skateable. Apparently this has resulted in the park being virtually empty on a daily basis...leading to some heavy BMX sessions. I'm sure the town is gonna fix the damage so get your sessions in before it's infested with kids again!